Famine Could Kill 20 Million in Africa and Yemen—Why the Deafening Silence? As with the threat to kick 24 million off health care here, unchecked power is bringing humanity to a grave crisis. Two striking stories, back to back, come our way as spring arrives. I cannot get either out of my mind—for what they say, for what they imply about everyone unmentioned in them, for what they do not say. In Yemen, the world’s worst humanitarian crisis, 18.8 million people require immediate aid. That is two-thirds of the population. 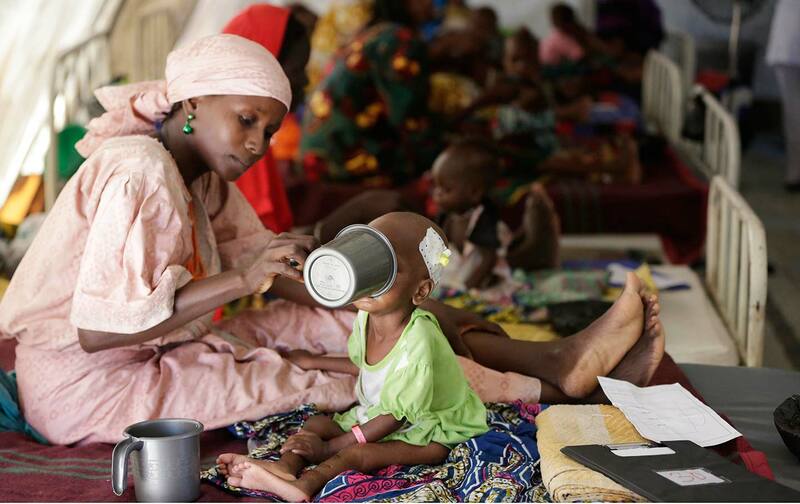 For 7 million–plus of these, starvation is imminent. I need to repeat that: A plane ride away from wherever you are, more than 7 million people are dying of hunger. In South Sudan—and what a birth for the world’s newest nation—more than 7.5 million people are at risk, a 22 percent increase in a year; 1 million–plus of these are acutely malnourished children. Somalia: More than half the country, 6.2 million people, needs aid; roughly half of that number face famine. O’Brien offered no numbers on Nigeria, who knows why, but I have it directly that UNICEF counts almost 1.4 million children “at imminent risk of death.” Widespread famine looms; Boko Haram, active in the northeast, has forced more than 2 million people from their villages. Homes, crops, schools, fresh water: all of it left behind. Last month, António Guterres, the UN’s new secretary general, said the organization needed $5.6 billion by the end of March just for Band-Aids—to alleviate the suffering, never mind the underlying causes. As he spoke, the UN had not quite 2 percent of that on hand—$110 million or so. On Thursday, Guterres reported progress: With eight days to go, he is now only $4.4 billion short. Here is the official summary of O’Brien Security Council briefing. Three days after he delivered it came the second story: The Congressional Budget Office reported that the Trump administration and the GOP-controlled Congress will deprive 24 million people of health insurance of any kind over the next decade, if their plan to eviscerate the Affordable Care Act remains intact as presented. Fourteen million of those will be off the rolls next year. It has been remarkable to note public responses to these reports. Plenty has been said and written about soon-to-be-uninsured Americans, as plenty should be. I question how many of us intend to do anything about it, and I will return to this point in a sec. When the extent of the breathtaking humanitarian crisis was breaking last month, The New York Times published a curtain-raiser on it, and good for the Times. After O’Brien’s stunning presentation, I think I heard a pin drop on First Avenue just north of the Secretariat. Do we make no connection between these two developments? The two stories just outlined concern the same thing. In a single word, they are about power. They are about people who have power, how they exercise it, and what happens to those who do not. Power is nakedly in evidence in all four of the countries on O’Brien’s list: These crises result from one or another kind of armed conflict. Do we entertain the fantasy—or delusion, more likely—that another manifestation of power does not animate America’s ridiculous, irrational discourse on health care, claiming millions of victims with the same spotless indifference? Do we think one thing obtains beyond our borders and something else within them? There’s vigorous outrage in behalf of the 24 million at home, but indifference to the 20 million elsewhere. Or—a painful question to pose—are most Americans dimly aware, somewhere within themselves, that they are dependent on—indeed, lent a hand in creating—the world order that has produced the crisis of 20 million? More than this, I cannot escape wondering if the same line of inquiry, yet more uncomfortably, applies in the case of the millions of Americans that could soon join the 29 million—yes, count them—already deprived of health care, ACA or no. How many of “us,” the properly covered, plan to act in behalf of those at risk? (And writing your compromised congressperson, or shouting at him or her during a scheduled gathering, does not count—or not for much other than an opening statement. This is not what I mean.) One hopes many, but that will raise another, larger problem. This is the problem of the nationalism that has come to impoverish our vision since, let’s say, 1975. In this case, it produces vigorous outrage in behalf of the 24 million at home and, so far as one can tell, indifference to the 20 million elsewhere. It is not a becoming match. It is not persuasive as to our humanity. As a society, we decline to universalize, and in this we fail ourselves as well as others. In the end, it fails the 24 million who stand to lose access to doctors as well as the 20 million who do not have access to food. I have briefly noted two recent news stories, but to achieve a true understanding of either, they must be taken as one. Written and read that way, one can recognize that irresponsibly wielded power now brings humanity to an epochal crisis, and Americans are not immune from its consequences. I take this to be the case. Let me make an attempt, and if I get partway up the mountain it will be better than nothing. I used to know someone in middle management at one of the UN agencies active in northeastern Nigeria. She is still there so far as I know. She had previously been stationed in South Sudan. Descriptions of her work and days in both places were litanies of horrors. Chronically short of time and staff, she put in 12-hour shifts, returning home at 8 p.m. on an easy day, 11 or sometimes later otherwise. Funding was eternally a knife’s-edge question. In the evenings, when things grew quiet, rats ruled the office. She would eat supper cold, straight from a can, and collapse. There may or may not have been transport on a given day from Abuja, the capital, to the camps in the northeast. I lost count of her bouts of malaria. I have known numerous others who lived and worked this way when I covered the “boat people” in Southeast Asia in the early 1980s. Over time this became my question: Are these people expressions of humanity’s concern or humanity’s neglect? My answer: Individual engagement, collective indifference. It is a surmise that bears some examination. The conception of human rights, based upon the assumed existence of a human being as such, broke down at the very moment when those who professed to believe in it were for the first time confronted with people who had indeed lost all other qualities and specific relationships—except that they were still human. Arendt wrote of refugees in this passage, after the mid-20th century’s catastrophes. She traced the problem of refugees to the very document the Western world still honors among the highest. France’s Constituent Assembly endorsed The Declaration of the Rights of Man and of the Citizen in the summer of 1789. Interpretations differ, but the title alone suggests the problem. Our concept of human rights rest on a delimited idea of what makes one human: Citizens are human and confirmed in their rights; others are objectified. Today this is plain in any refugee camp you can visit. We have institutions authorized to manage them, to administer them, and periodically to resupply them. My experience derives from time spent in Asia. I cannot think of a single instance when the whole, fully defined humanity of a refugee was ever where things began or ended in camps I visited. Our concept of human rights rest on a limited idea of what makes one human: Citizens are human; others are objectified. Arendt’s immediate concern was the nation-state, but her core topic, if I read the text correctly, was belonging and how this is determined. As then, so now: We do not know what to do with people who belong to the human race but not much else. In his not-to-be-missed Homo Sacer, Giorgio Agamben, the noted Italian philosopher, calls this condition “bare life.” The world now teems with bare lives, and the world does not know even what to think of them. You must be white to belong…. You must be Christian to belong…. You must be born here to belong…. You must speak this language to belong…. Belonging is conferred or denied by “sovereign power”—Agamben’s phrase. And you must belong to have what we get away with calling human rights. How do we define our human values? Against what standard? The Declaration was an epochal advance when published in 1789. But history had outpaced its terms by Arendt’s time, and in ours they are far back in the dust. We know of the world—instantly, all of it—more than we seem to manage. Every event occurs nearby now, in the way “nearby” once ended at the edge of the village. We are either unable—or unwilling, maybe—to alter the way we live to take account of all we know. This is implicit in the argument Peter Singer makes, if I read him rightly. A few years ago the Princeton ethicist got very granular to make his point: $200 spent on a couple of splendid shirts would save one child’s life if given to the right organization. (And he named some.) People did not know this even 50 years ago. The question forced upon us is obvious. With knowledge comes responsibility, in other words—nothing too complicated there. Anyone can talk about “the refugee crisis,” or—we ought to get used to it—“the hunger crisis.” We must speak now about the crisis precipitated by our unprecedented awareness—the true locus of the problem. As a society, we are ducking. So far as I can make out, the unexamined assumption is to go on as we have, pretending—pretending, Mrs. Lincoln—that as human crises unfold, it is enough to send a few bucks and well-intentioned souls to the scene. Our humanitarianism does not pass as humane, to put the point another way. I propose facing this as a 21st-century task. … and so they give their money and their allegiance to whoever appears to be doing what they feel should be done. Their fatal temptation, to which, mostly, they appear to succumb, is to assume that they are, then, off the hook. Baldwin was writing in and of the late 1960s and early ’70s. Trying to wriggle off the hook remains a liberal pastime, but the consequences are beginning to land now with a weight that does not seem manageable. This holds true abroad and also at home. At some point the humanitarian crises described above must overwhelm us—as Europe now advises us. Not unrelatedly, Americans as well as Europeans are plunged into startlingly similar political crises. Scores of millions abroad, scores of millions at home: To one or another degree, exclusion is the point. At some point the humanitarian crises described above must overwhelm us—as Europe now advises us. What we now call the liberal order lies at the root in both cases. It is plainly in crisis and, in my read, simply cannot any longer be defended. Here I come to a couple of ugly truths. With them come the responsibilities suggested above. One, we need to ask ourselves how dependent—we as a society, we all of us—have become on a global order that lands us with Somalias and South Sudans and Yemens as more or less a “new normal.” My answers are “very” and “too,” and I offer the still-common embrace of liberal interventionism among many Americans as my index. Directly or indirectly, the policies so signified have been the No. 1 source of global disorder since the triumphalist 1990s. “Humanitarian intervention” was hopelessly discredited by the end of the decade: It was plain by then that we could not, or could no longer, set our own interests aside sufficiently to act cleanly in the interest of others—with the compassion that comes with simply being human. This, too, needs a long look and a fundamental rethink. William Appleman Williams warned in his last book about “empire as a way of life,” and we are living it. Are we so self-absorbed as to find this reality acceptable? We would rather talk about Trump’s neckties? I will make the second point with reference to the single most revealing question posed during those long-ago days when everyone assumed Hillary Clinton would be our 45th president. “When Trump is defeated,” someone simpered on the Times opinion page, “will Trumpism go away?” Astonishing that someone would ask this, I recall thinking. Do you see the problem—apart from the childish “go away” phrasing, I mean? No thought of reckoning with the voices of what turned out to be 60 million people. Only the perverse hope that they would again be confined to silence. There is no pretending this impulse has evaporated now that Trump is in the White House. It is no longer a question of two worlds meeting, for the simple reason that there is only one. The wretched of the earth are not over there, or beyond our shores, and we, the more fortunate, safe and sound over here. That “stupendous delusion”—Baldwin’s phrase—is at last worn out. A lot of people will continue entertaining it, no doubt, but the cost of doing so, from here on out, will be unforgivably high.